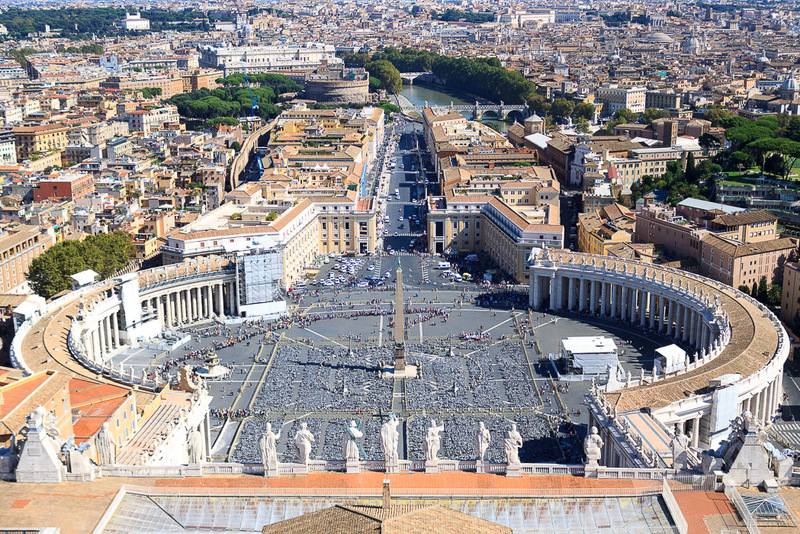 The Vatican Obelisk has a height of 83.6 feet (134.5 feet with base) and weighs 331 tons. It stands on a base 27 feet wide. This is the only obelisk in Rome that has not toppled since Roman times. This obelisk, like two others in Rome, is uninscribed, but is stated by St. Peter's - Guide to the Basilica and Square to have come from Heliopolis (Cairo), Egypt, where it was built by the Pharaoh Mencares in 1835 BC in honor of the sun. It is made of red granite. 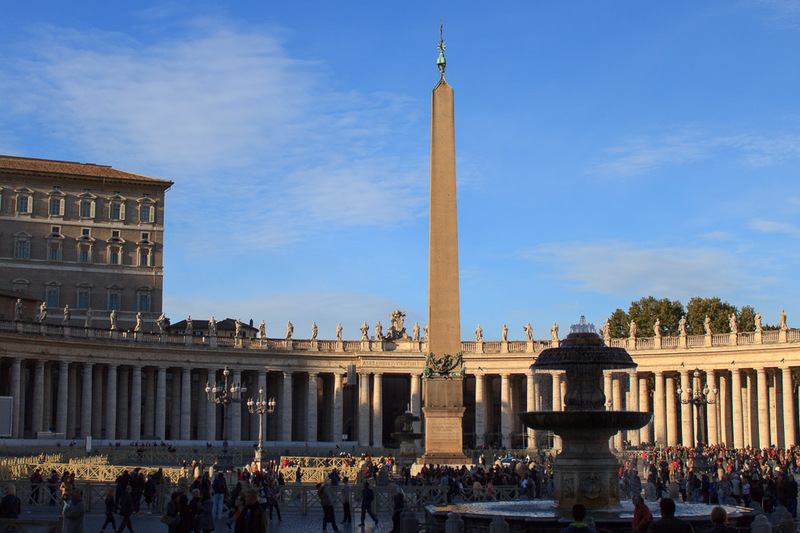 It is the oldest monument in St. Peter's Square, and might be the oldest obelisk in Rome. It is known that Emperor Augustus ordered it erected in the Julian Forum (Forum Iulium) in Alexandria by the prefect Cornelius Gallus around 30-20 BC, where it stayed until 37 AD. That year, the Emperor Caligula had it transported to Rome on a specially built ship, and erected in the spina of the Vatican Circus (later named Nero's Stadium, or the Circus of Nero, built by Caligula on the grounds of what is now the Vatican) in Rome. There it stood on a spot perhaps 50 feet from the left outside wall of today's St. Peter's Basilica, near the left transept. After the voyage, the ship, which had been specially made to transport the obelisk, was filled with pozzolana and sunk so as to be used as the base for the left pier of Claudius' harbour, at the mouth of the Tiber River. According to the Egyptologist Labib Habachi, "Legend has it that in the Vatican Circus innumerable Christians, including St. Peter, were put to death and that the reason this obelisk was not later overturned as were all the others in Rome was that it was looked upon as the last witness to the martyrdom of St. Peter." See all Vatican Obelisk photos. 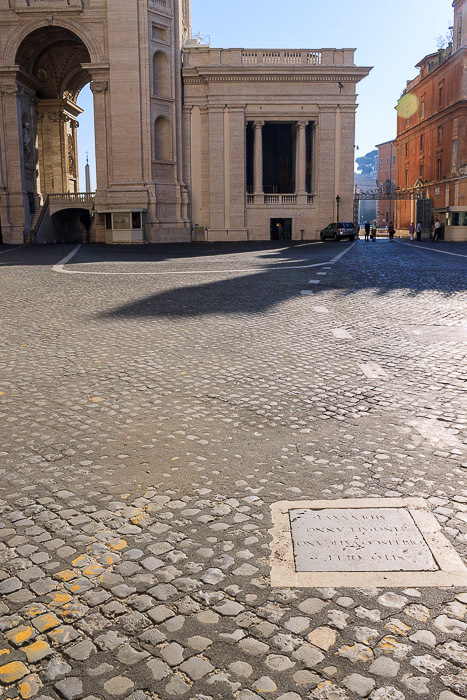 The spot where the Vatican Obelisk originally stood. Look through archway beside St. Peter's Basilica to see the obelisk today, in the center of St. Peter's Square, about 800 feet away. 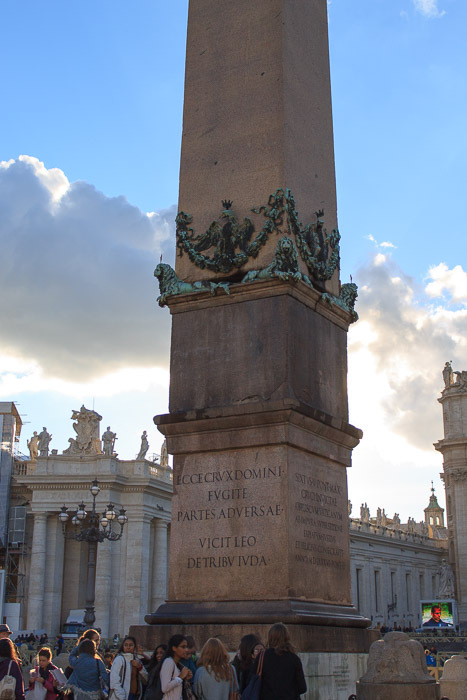 In 1586 the Pope Sixtus V directed the obelisk to be re-erected in the collonnaded square before the Basilica of St. Peter, where it remains to this day. The spot where it stands is only about 800 feet from where it stood in the spina of the Vatican Circus (see last photo above). During the Middle Ages, the gilt ball on top of the obelisk was believed to contain the ashes of Julius Caesar (also Augustus and Tiberius). That, and the fact that Nero was thought to be a sorcerer during the Middle Ages, might explain the fact that the obelisk was never toppled. During its relocation, workers carefully inspected the metal globe that had stood atop the obelisk since Roman times. They looked for the remains of Caesar, but they found only dust. That ancient metal ball is now in the Museo dei Conservatori of the Capitoline Museum in Rome. After the successful re-erection, triumphant Romans carried the chief engineer, Domenico Fontana, on their shoulders all the way to his home. 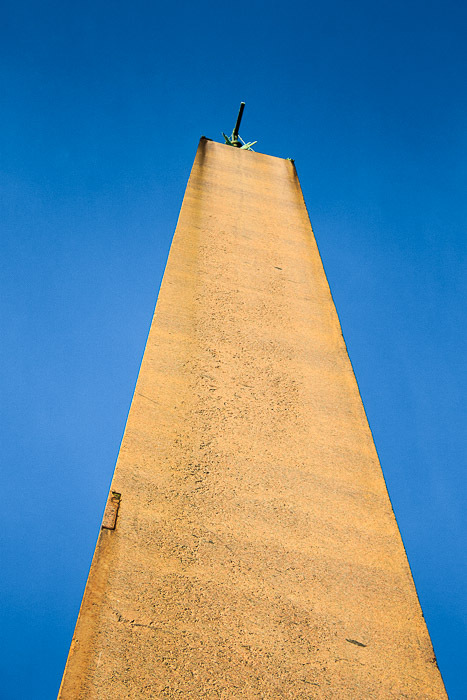 This was the first obelisk to be re-erected in "modern" times, and was acknowledged as a great accomplishment. This operation took four moths, required hundreds of workmen, and used 900 men, 75 horses and 44 winches on the day of the raising. The story of its raising is Roman legend: how in 1586 Pope Sixtus V ordered the huge crowd of spectators to remain silent under pain of death, how the ropes were about to break under the strain of the column's weight, how a Genoese sailor risked his life, screamed, "Water on the ropes!" and thus saved the obelisk from crashing into a million pieces, how the grateful Pope ordered that henceforth all the Vatican's Palm Sunday fronds be purchased in Bordighera (they still are). The inscriptions on the north and south sides of the base have texts written by Cardinal Silvio Antoniani as a memorial to the moving of the obelisk. The east and west sides have exorcist formulas. The obelisk is also a sun dial, its shadows mark noon over the signs of the zodiac in the white marble disks in the paving of the square. The obelisk rests upon four couchant lions, each with two bodies whose tails intertwine.